Scientists are closing in on the secret recipe for high-temperature superconductors. The secret ingredients are still unknown, but new research at Cornell and Brookhaven National Laboratory has revealed a little more about how they are mixed. Three previously observed events associated with the emergence of superconductivity turn out to occur at the same time. Two out of three of these events – the disappearance of a “striped” arrangement of electrons and a broken symmetry in the arrangement of electrons around atoms – had already been observed to occur together. This inspired researchers to compare those events with the distribution of energy levels of the electrons in the material that are free to conduct electricity. They report their results in the May 8 issue of the journal Science. “You can see that these density waves or stripes are clearly impeding the flow of electrons. We know that when you get rid of the stripes we get far more [free] electrons,” explained J.C. Séamus Davis, the James Gilbert White Distinguished Professor in the Physical Sciences at Cornell and director of the Center for Emergent Superconductivity at Brookhaven National Laboratory. Complex ceramic materials called cuprates – copper oxides “doped” with small amounts of other elements – can superconduct, or carry an electric current with zero resistance, at temperatures up to 150 kelvins (degrees Celsius above absolute zero). 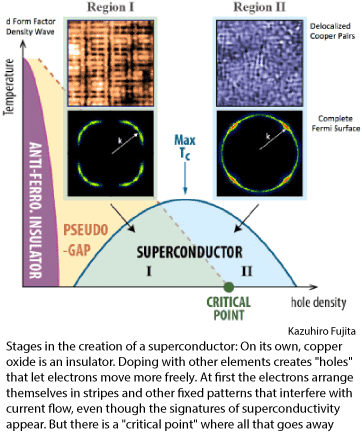 Doping distorts the copper oxide crystal structure and creates “holes” – places where electrons ought to be but aren’t. Somehow this enables electrons that would ordinarily conduct electricity in the usual way to join in “Cooper pairs” that can move without resistance. Cuprates have many industrial applications, but they must be cooled with liquid nitrogen. If researchers can figure out how they work, it might be possible to design new materials that would superconduct at room temperature, revolutionizing power generation and transport. For several years Davis and colleagues have studied these materials using a scanning tunneling microscope (STM) buried deep in a sub-basement at Cornell and so well insulated from vibration that it can scan a surface in steps smaller than the width of an atom, with a probe so fine that its tip is a single atom. By measuring current flow between the tip and the surface, the STM can map the locations of electrons and determine their energy level – in effect, how much energy it takes to pull an electron loose from its atom. So it can simultaneously observe all three of the phenomena the scientists are trying to connect. Davis and postdoctoral research associates Kazuhiro Fujita and Mohammed Hamidian scanned a series of samples of a cuprate doped with bismuth, strontium and calcium with a gradually increasing amount of doping. It was about a year of painstaking work, Davis reported. As expected, they observed the development, and then sudden disappearance, of electron stripes and broken east-west/north-south symmetry of electron arrangement between copper and oxygen atoms as doping increased. And as they had proposed, they found an abrupt shift in the pattern of energy levels of electrons free to carry current. All three events occur simultaneously when the level of doping reaches 0.19 percent. Intriguingly, the first two have been observed in many other cuprates at the same level. The work of the Davis Lab is supported primarily by the U.S. Department of Energy and the National Science Foundation.